How Not to Spend Money Hiring Someone When You Can Do It Yourself, Cheaply and Better! Build your confidence and learn how to make home improvement repairs yourself in this step-by-step guide and advice on home repair and improvement. Get a better understanding of electrical wiring and equipment, and learn how to become an expert in installation, repair, and maintenance. Want to relax on the weekends, but have to clean the mess around you? The decluttering journey doesn’t need to be as unpleasant as some make it out to be. In fact, there are a variety of people who have come up with some of the pretty, fun, and creative ways to get started. Declutter your home with our time- and sanity-saving home organization tricks. With our quick cleaning tips, you'll get to spend more time enjoying your beautiful home than tidying it up. Cleaning and organizing the house. Are you overwhelmed by the chaos that surrounds you? Do you wish you had greater productivity and peace of mind? Whether you want to (1) easily organize each area of your life, (2) regain your motivation and peace of mind, or (3) be happier and more productive, this is the audiobook for you! Stay Orderly and Focused With This Book! From the home organizers who made their orderly eye candy the method that everyone swears by comes Joanna and Clea’s signature approach to decluttering. The Home Edit walks you through paring down your belongings in every room, arranging them in a stunning and easy-to-find way (hello, labels! ), and maintaining the system, so you don't need another do-over in six months. When you're done, you'll not only know exactly where to find things, but you'll also love the way it looks. Clutter-free solutions to help you get organized, stress-free, and happy! 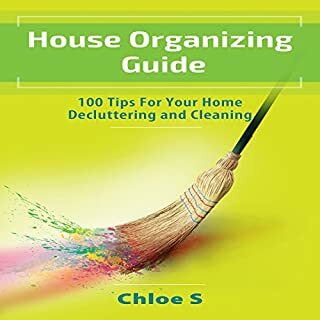 If you are looking for inspiration to get started and want to discover how to declutter your home with professional organization tips, then this is the audiobook for which you have been waiting. From the cleaning and home-keeping expert and creator of the wildly popular Clean Mama blog comes a simple and accessible cleaning guide with a proven step-by-step schedule for tidying a home in just 10 minutes a day. Systematic—but way more than "10 minutes a day"
In this insightful book, Palmer shows how to get rid of the things in our lives that no longer serve us. By tossing out these unneeded items, we are also eliminating their negative influences, freeing up energy, and unlocking our potential. Loaded with inspiring anecdotes and practical tips, Clutter Busting is based on the premise that your things are not sacred, but you are. Have you ever wanted to get into woodworking but didn't know where to start or know what size shop you will need? Maybe you like the idea of woodworking as a way to turn a profit, occupy down time, or just to learn a new skill. Or perhaps you found a field that you are interested in but you don't know what tools you need to buy? Well, you've come to the right place! With this groundbreaking audiobook, lifelong industry expert Jim Molinelli helps every homeowner master their own remodeling process. From the proper mindset, through preparing a Project Packet, identifying the right design, and remodeling professionals to use, and then how to interview and negotiate with the perfect remodeler for your project - listeners will learn it all. Are you suffering from CHAOS, otherwise known as Can't Have Anyone Over Syndrome? If your house is a jumble of dirty dishes, piles of paper, and never-ending laundry, you are probably afflicted. But don't give up hope, because now there's an antidote: The CHAOS Cure. In her eagerly anticipated new book, Marla Cilley - aka "The FlyLady" to the hundreds of thousands who visit her website for daily domestic inspiration - reaches into our homes to help make housecleaning more meaningful and life less messy. The life hacks I tried actually worked. The book I have been waiting for! Are you tired of doing things the hard way? Would you like to save time and money? 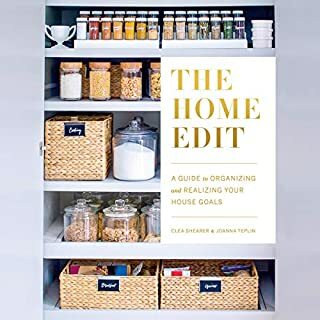 Whether you want to (1) discover incredible household hacks, (2) save time and money, or (3) optimize and organize your home environment the right way, this is the audio book for you! The best hacks and tips for cleaning and organizing your home! Hacks are wonderful shortcuts and clever tricks that make it much easier to live your life. These household hacks are innovative solutions to many of the problems you may face on a regular basis. Rediscover joy in your environment. Being chronically disorganized can affect your relationships and your mental well-being, as well as your physical health! In this audio book you will discover what you can do to put everything in its proper place for peace of mind and a happier, healthier life. Rid your house of toxic chemicals and clean just as effectively using natural methods. Discover ways to easily clean, optimize, and organize every room in your home. The best household hacks in modern history. Don’t settle for toxic store-bought cleaning products, unorganized methods of storage, and spending all kinds of money on things you don't really need. Throughout this audio book you will find incredible hacks for simplifying your life, maximizing your money, building a safe environment for children, and creating an inviting ambiance for both yourself and your guests. Discover just how incredible your home can be. Live better: Buy It Now! Would you listen to Household Hacks: 150+ Do It Yourself Home Improvement & DIY Household Tips That Save Time & Money again? Why? 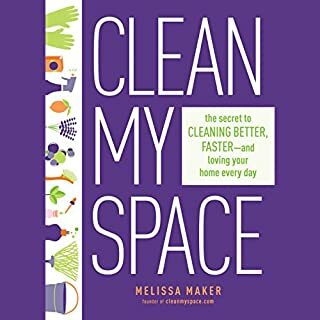 This is a great book of recipes for cleaning products that you can make at home using things that you probably already have somewhere in your home, such as baking soda, white vinegar, water, essential oils, and yes, even vodka! What I like most is that it includes safety warnings to make sure you don't get hurt using it, like avoiding just pouring the floor cleaning product on the floor, because it might make it super slippery. Not only that, but it also covers ways to organize your home better and clear up clutter, making it a great combination of things to do to help your house function better and in an all-natural way.I would listen again to take notes on the various recipes that are available for cleaning products. I truly enjoyed every minute of this book. Utilizing the bookmark with a note feature let me easily mark the recipes that I wanted to implement straightaway. I have wanted to ease myself into making my own cleaners but it always seemed very very overwhelming and like I would need to be so organized before beginning. This took every bit of anxiety and stress of starting this process away and now I am headed straight to the store to grab my supplies! highly recommend! gives cleaning, organization, time & money saving tips! I would buy this in print. If you could sum up Household Hacks: 150+ Do It Yourself Home Improvement & DIY Household Tips That Save Time & Money in three words, what would they be? I'm inspired to make safe & actually EFFECTIVE cleaning products now. And who knew you could unshrink your clothes? or get pen out? Fantastic Hacks for Everyday Living! Hacks are all the rage these days, and "Household Hacks" is a great example of why! But, you don't need to search any farther for well over 150 hacks that you will come back to every day. 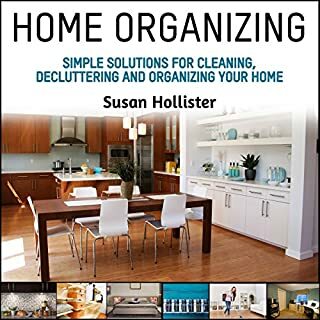 From cleaning with non-toxic, make-it-yourself cleaning solutions to reducing your household expenses, this book has it all. Egg carton jewelry boxes! Best way to clean and sanitize sponges! Making laundry detergent in ice cube trays! Yes . . . and much, much, much more! I am a hack hound, and there were many that I had never heard of before. "Household Hacks" is full of solid, practical advice that you'll wonder how you did without. Who's house couldn't use some improvements? I found this audio very helpful for solving issues with my home that I have been wanting to fix for a while now. It offers solutions that you can do yourself and are affordable to do. There are now some other new ideas that I have after listening too! This is a perfect resource for any home owner! I love to learn new ways to clean and organize my house without the use of toxic chemicals! Well, at least the cleaning part is toxin-free. This book has both the cleaning and the organizing down pat. With close to two hundred separate tips, it was bound to reveal a few I hadn't yet heard, and boy, did it deliver! My favorite was the trick of cleaning burnt-in food from pots that appear to have no hope. With a couple common household ingredients and 48 hours of just sitting there, the black stuff just floated off the metal. I was dubious, but I tried it and this hack really did work. Now to tackle the juice stains on my favorite armchair. No, I didn't make them, but I sure want to get rid of them! Yes, I would definitely listen to "Household Hacks..." again because there are so many good DIY ideas to save money with so many ingredients. If I need to clean something, and I can't get it, I can make it myself. What other book might you compare Household Hacks: 150+ Do It Yourself Home Improvement & DIY Household Tips That Save Time & Money to and why? If I was to compare "Household Hacks" to another book written by Ace McCloud, I think it would be "Money, Saving Money..." The reason I chose this book is because it teaches you how to save as much as you can, and what better way than to start by making your own cleaning products, etc. Well since "Household Hacks" is a DIY book, there were no characters in it, so if I had to choose, it would be Joshua Mackey for his narration, and Ace McCloud for his writing. Again, this is a DIY, self-improvement book, it did not make me laugh or cry. Great timne and money saving tips for everyone! This audio is filled with time and money saving hacks that are easy to implement! I have had a smelly dishwasher for a while now and learned how to easily get rid of the smell! It's also super handy to know how to make my own all natural cleaning solutions. The idea of putting velcro on my remote control to hold it to my cofee table in a designated spot was something I put into practice and thoroughly enjoying having my remote in that spot whenever I need it. 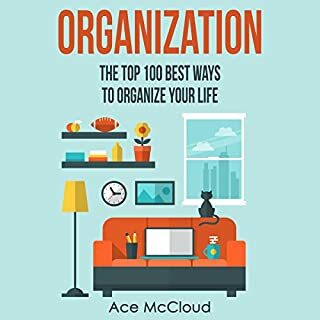 There are too many hacks to list, biut a few more of my favorites where how to remove rust easily and the chapter on organizing is a must listen to for anybody. Well worth the money to get all the powerful information here. Highly recommended! Household Hacks by Ace McCloud makes an enjoyable listen. The audio book allows the reader to hear many tips that help in everything from day to day cleaning to making your products more efficient. For anyone on a budget, this audio book explains how we can simplify our lives at home by making the most of our tools and money. I highly recommend this to anyone in a home! "Hausehold Hacks" - have a perfect home! What did you like most about Household Hacks: 150+ Do It Yourself Home Improvement & DIY Household Tips That Save Time & Money? 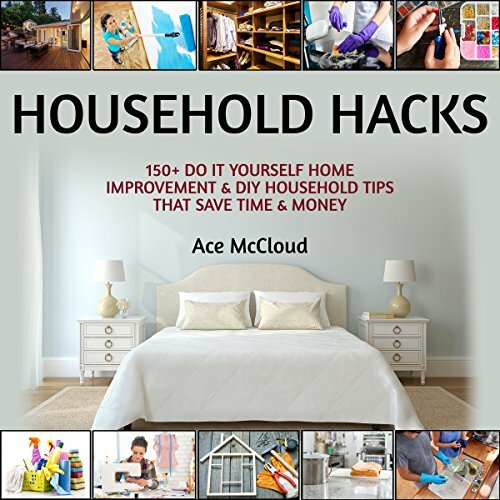 “Household Hack” by Ace McCloud is a very handy audiobook contains home remedies for cleaning and stain’s removing. What was one of the most memorable moments of Household Hacks: 150+ Do It Yourself Home Improvement & DIY Household Tips That Save Time & Money? McCloud suggests plenty of great solutions how to keep your house clean and healthy. Instead of buying very expensive and harmful for environment chemical cleaners is worth to keep just few of ingredients. Very useful to keep is white vinegar, hair conditioner, Borax, washing soda, baking soda, salt, Alka Seltzer tablets, lemon juice. You can mix them and use in certain proportion to remove stubborn rust, clean your toilet, carpet stain, wash your dishes and floor. So many useful and handy tips that you have never know how fantastic and efficient work for your home. Joshua Mackey is a fantastic narrator and provide high quality performance with right pace, clear voice and nice accent. Very valuable experience! I have real pleasure to listen and find this audio book very informative. With “Household Hack” you not only find out how to clean but also how to refresh your environment and even saving money, food and time. You can see how to homemade aromatherapy with different ingredients like lemon, cloves, eucalyptus, pine cones, coffee and much more. I love idea about making dry potpourri. It is a great pleasure to collect some flowers, leaves and stick and let them dry and mix together in most beautiful and decorative way. Lovely and practical audiobook with so many useful tricks, hacks and solution that is definitely worth to know. Average - not sure it's worth the money paid. Very Average, ironically I am not sure it's worth the money. I 've listened to far better audiobooks on similar subject. This is a really cool guide with lots of ideas you can use around the house to be more efficient, organised and to save some money. I particularly enjoyed the section about homemade cleaning solutions made out of common ingredients as I am very conscious that shop bought products contain a lot of harmful chemicals that can be very bad for your health. There are lots of little ideas I am going to try from this book. 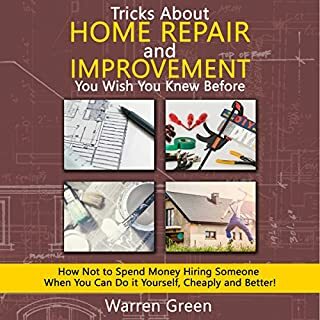 This book can be a great help to anyone who wants to learn new household hacks and tricks and save money. For example, many everyday issues are covered such as fighting the grease or learning the benefits of using washing soda in the household (more than I was aware of so far). In this book you can learn how to make your own washing soda, all purpose cleaners, antibacterial cleaners or other type of cleaners. No more stinky onion hands – superb advice! If you want a sparkling house make sure you take notes or go through this book a few times trying to remember all the useful tips and tricks.